Good sleep last night. Very good. I think Reagan woke up around 8, which is grrrreat! She also woke up in a wonderful mood making this mommy very happy. Unfortunately, it didn't last long. She started fussing as we headed up the elevator to her physical therapy session, moaned and groaned as we waited in the waiting room, and then had a full out meltdown once her therapist started working with her! I had to break out the bottle to soothe her and she fell asleep. We ended up just talking to her therapist for the majority of the session. Then we headed over to her pediatrician's office. She woke up in the parking garage and then started back up with the crying once we got to the office. Again I broke out the bottle( aka pacifier) to keep her quiet. They weighed her in at 28lbs (40th percentile) and measured her at 35in (25th percentile). She's fallen a little in the percentages since her last visit almost a year ago but she's still doing well considering how little she eats. The visit was mainly just to catch her pediatrician up on everything. She's really good about calling medicines in for Reagan so we never have to even bring her into the office. I feel guilty that we never go in and actually see her, so this was our token visit of the year. We left her office and Reagan fell back to sleep in the car (it's very unusual for her to take so many little naps) and we headed to her Feldenkrais session. I figured we'd go ahead and give it a try but as soon as I laid her on the table it was clear I had made the wrong decision...she had another total meltdown. This one was full of tears and breathholding. We tried to work through it, but Reagan was just not having it. She fell asleep (again) as soon as I put her into the car. I'm not sure what's been going on with her today. Therapywise, it was a complete loss. It was not a fun day, for anyone. Finally around 7pm tonight I saw a change of attitude. The sweetness returned to her face and she's been good ever since. She drove me CRAZY today but when she turns it on like she has tonight, she rights all wrongs! She sure can be sweet when she wants to. Last night was tough. Reagan's fussiness and tummy pains just before bedtime was a good indication of how our night would go. She was restless. We put her in our bed but she kept waking up moaning and whimpering. It was miserable. Finally around 4am I got up with her and once she actually opened her eyes she cheered up a little. We weren't up long but the damage was done. I was exhausted all day today. 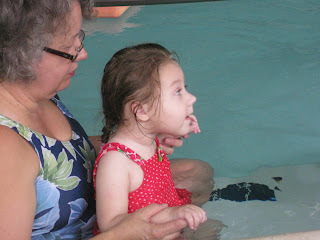 We went for her second aquatic therapy session (she missed last week when she was sick) and she seemed to be enjoying herself most of the time. I say most because she had a little meltdown at the end of the session. We had to cut it short 5min or so and pull her out of the pool because she was so hysterical. If I had to guess, I would say that all of the moving and bending of her legs worked some gas out and gave her some gas pains. Maybe it was just irritability from lack of sleep last night. Who knows. She can't tell us. She did recover and fell asleep as soon as we put her in the car seat. Then we came home for a little while and I tried to get her to eat. She has been fighting me with that all day. She's choking on her own spit and then refusing to eat. It's frustrating to say the least. Then we headed back out for her Feldenkrais session. She was very good the whole time...until the end! Another meltdown! No clue what's going on with her. We put her in the car and again she fell right to sleep. Maybe she's just tired. She certainly has been high maintenance today and it's more than just whiny, she's been moved to tears more times than I can remember. That's definitely out of character for her. I just hope she sleeps tonight. This sleep deprivation is really wearing on me. I've had a headache for days. Tomorrow she's got PT and then a well appt with the pediatrician. I'm always scared to go in there because she usually goes in well and comes out sick. Please keep it in your prayers that doesn't happen. She's just now getting over the sickness from last week! Reagan slept like a log last night...and so did we! It was sooooooo nice, she didn't wake up til 8:30am. I'm actually amazed that she can make it through a whole night the way she sleeps. I'm was her watching tonight, taking a late nap, and she was twitching and moving her arms almost nonstop. Doesn't sound like a restful way to sleep. Poor thing. I don't really know how she can function at all, when you consider how many seizures wrack her body every day, all day long. It's brutal. I finally spoke with her long lost neurologist this afternoon. He said that we need to increase the Banzel a little more before we can rule it out completely. He agreed to let us raise it more quickly but if we see more seizures we're calling it quits. So this is Banzel's last chance. Please keep this in your prayers. She certainly needs some relief from these nasty things. 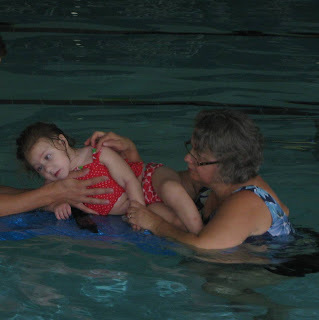 Reagan did hold her own today with back to back to back therapies. She was so good, she put up with all kinds of stretches and manipulations without so much as a peep. Tonight didn't go as smoothly. We had a little incident. A throw up incident. I think it was just because she had a full tummy and was laying on Mike tummy down. Maybe it's the new reflux med. Right now she's only on an am dose, maybe she needs a pm dose of it? I don't know. All I know is I do not want to go back to daily throw ups. Yuck! She also had a bout of tummy pains this evening followed by a dirty diaper right before she fell asleep. She was still fussing as she konked out. She had been doing so well the last month or so but it seems the tummy pains are coming back and getting more and more frequent. Not good. Hopefully she'll be able to sleep tonight. She's got aquatic therapy tomorrow morning so she needs her rest! Below are a couple pictures of her therapy room (one half of it anyway). The pictures don't really do it justice. There's a lot of work that still needs to get done...we're changing out all of the electrical plugs and putting in a new ceiling fan (Mike is), we have to hang the paper lanterns, hang mirrors, build a therapy table and ramp, add roman shades...the list goes on and on! It's a work in progress. Reagan being entertained by Elmo. She LOVES this thing! Reagan, Reagan. She decided at 2:30 last night she wasn't tired anymore so she and I spent 2hrs of quality time together until she wore herself out and fell back asleep. Thankfully she was in a great mood when she woke up. Let me tell you, nothing's worse than being up in the middle of the night with an irritable, crying (seizing) baby! I've certainly had my share of those nights! Today has been about the same as yesterday for Reagan. Still full of tone, still grinding her teeth, still having lots of seizures...but she's been very happy and talkative all day. I went ahead and continued with the scheduled increase of Banzel. She's now at 3/4tab am (150mg) and 1/2tab pm (100mg). I'm not sure if that's what's causing her increase in seizures but I want to make sure we give it a fair shot before giving up on it. Hopefully I'll hear from her neurologist tomorrow and get his opinion on the matter. Today after a full day of painting, we finally finished Reagan's therapy room and our master bath. 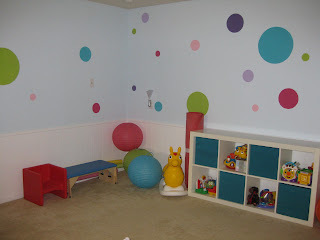 My mom painted dots on the wall of Reagan's therapy room, not the easiest of tasks, but it looks so cute now! I'll have to take some pictures and post them on the blog tomorrow. No more painting! Yeah! We have painted nearly every single room in this house. That's a lot of painting, especially for someone who hates to paint! Tomorrow's a busy day. Three different therapies all back to back. Hopefully we'll all get some sleep tonight so that we're able to function tomorrow. Please keep Reagan in your prayers...she really needs some relief in the seizure department. Reagan slept well last night and then woke up this morning a changed baby (thank God)! Super happy and very talkative. She's really got Dadee and Dada down now. It's funny, when she wakes up in the morning we'll usually hear her babbling in her crib, and then we'll hear her shout Da! Like she's saying, OK come pick me up Dad! It's too funny. 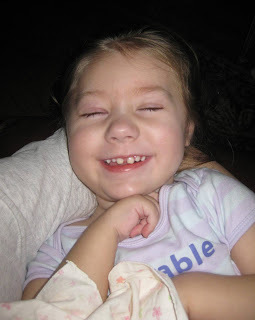 Seizures are still about the same today, maybe a few less tonics, but still nonstop twitches. She's also been super spastic today, very high tone all over. Even in her mouth. I've noticed lately she's started grinding her teeth again but today she's been doing it almost nonstop and clamping her teeth down so tightly you can hear it. Actually a few times today she had blood coming out of her mouth from biting the inside of her cheek while doing this. I don't know what to do! How can we stop her? I'm afraid she's going to tear up the inside of her mouth! I wonder if maybe she's teething? She did try to bite my hand today. I noticed last night that her cheeks were really hot and red, maybe it's all related? It's so tough trying to figure these things out, it's not like she can tell us what's going on. Frustrating. She was getting a little irritated right before bed so I gave her some tylenol, maybe that will help. Speaking of, I've had a headache all day and tylenol hasn't even made a dent in it. Thankfully, no more episodes of vertigo. That was so strange. Today we switched reflux medications again...sort of. I just switched Reagan over to the generic of prilosec, omeprazole (which was also the main ingredient of Zegerid). I just couldn't fight her anymore to get that Zegerid down. It was seriously taking me an hour, an HOUR, to get her to take 25mls of this medicine dissolved in water. Not to mention she was gagging and dripping it out the whole time! So now we're getting the omeprazole in capsules that can be opened and sprinkled on applesauce...which she'll eat no problem in about 30seconds. I'm still not sure if the new medication is working better than the Nexium, but I guess time will tell on that one. Please continue to keep Reagan in your prayers. Today has been a rough one. For Reagan and for me. Sleep was fine last night, but this morning just as her Feldenkrais lesson began, Reagan had a major meltdown. 4.5hrs of nonstop screaming crying, a nap, and then on and off crying for the rest of the afternoon/night. We had to cancel her feeding therapy and good thing we did because it would have been one miserable session. 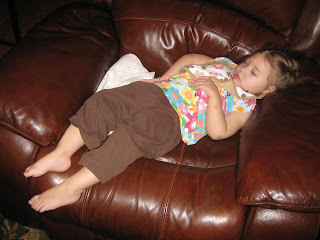 I'm not sure what was bothering her, tummy pains if I had to guess, but the seizures were ridiculously bad as well. She had nonstop twitches and seizures pretty much all day long. She's also having way more of the bigger ones and they are morphing more into just plain old tonic seizures. 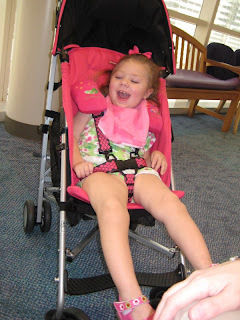 For a while we were calling them myo-tonics because they were brief and only her arms would stiffen out, but now they are moving all the way through her body, her back is arching and her legs are stiffening out as well. I really hate these. And it's just so frustrating that things seem to be getting worse rather than better. We're seriously running out of medications! What are we going to try next?!?! Meanwhile...no one seems to care. There's no sense of urgency. 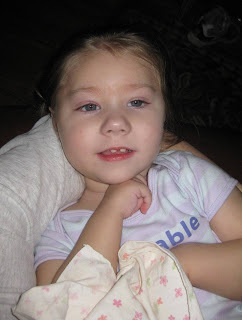 No one (other than us) seems concerned by the fact that our daughter is literally having 1000+ seizures a day! Are the doctors just that jaded or is there really NOTHING they can do to help? Our neurologist has been out of the office for 10 days straight, so it's not even like we can call and talk to him about it. But even if he were here, he wouldn't do anything. Here we are 2yrs into Infantile Spasms and Reagan hasn't had a single seizure free day or even responded positively to any of the 14 medications she's tried! I'm beyond frustrated. I was thinking about this today, as my mom was holding a screaming Reagan in the other room, and I started feeling lightheaded. I don't know if that's the right term, vertigo is probably a better explanation of it. I was in the kitchen, I bent over and when I stood back up the sink was moving back and forth in front of me. I felt like I was on a boat. It was really bad at first and I was afraid I might fall over (thank goodness I wasn't holding Reagan), and even though it lessened over time, I could still feel it hours later. It was very strange. I've never experienced anything like it. Hopefully it was just stress and not a big deal. On a positive note, right before Reagan went to bed tonight, she really turned things around. She was being super cute and talkative. Whispering sweet nothings in her Daddy's ear! Hopefully that means she's feeling better and she'll sleep well tonight and wake a changed baby tomorrow. Please keep her in your prayers, it's been a rough day and we sure need a good one tomorrow! It was a long one last night. Reagan didn't go back to sleep until 1:30am but she did sleep through til 6:30am. Problem is, I could sure use more than 5hrs of sleep! I'm exhausted. What's funny...she seems fine! I've been dragging all day but she's been happy as can be. The only therapy she had today was Feldenkrais, she had a great session and then we headed over to Ikea with Grandma. It's funny, I rarely get out to go anywhere other than to Reagan's therapies and doctors appts, so this was quite the treat! We found all kinds of neat things for Reagan's therapy room! The main purpose of the trip was to find some sort of shelving to store her toys, but we ended up bringing lots more home than that! We found some round paper lanterns in bright colors (fushia, green, and turquoise) that really inspired us as to what direction we want to go for the color of the dots on the walls! Sounds like we'll be painting again this weekend! I think they will work well to provide some visual interest for Reagan while she's doing her therapy. We also found a neat swing to hang from the ceiling. It's called the Ekorre and she's tried it before at her old therapy place and seemed to like it. It's only $30 (the link says higher) and that includes everything you need to hang it...a real deal compared to the special needs swings you have to take out a small loan to afford. We walked through the entire store without so much as a peep from Reagan. She just sat in her stoller smiling away! She was a perfect angel! And she seemed to enjoy getting out and seeing the world. Poor thing, I don't take her out much. I don't know if it was all the running around today or what but she did not want to eat! Every time I tried to give her a bottle she was very disinterested. She only drank about half of her regular amount (which is already way less than she should be drinking for her age/wt). I guess I'm just going to have to do my best to pump her full of fluids tomorrow. Time for bed. Hopefully it will be an all nighter (of sleep, that is). Today has been a strange day for Reagan. She had an alright night last night, she finally fell asleep around 11 (of course we didn't get to bed til midnight) and she woke at 5:30am. I would have preferred her to sleep in a little longer, but I guess beggars can't be choosers. We didn't have too much going on, she had Feldenkrais at 1:30 and then we came home for an OT evaluation by ECI. The nice thing about ECI is they see them in the home, so we wouldn't be running around for extra OT visits. The bad thing is, the therapist doesn't even come close to comparing to the other OT she sees twice a month (who is no longer covered by insurance). I know, I've only just met her, but it's apparent. And I don't like the way she said that we shouldn't even set goals for Reagan to actually grab toys...insinuating that may never happen. I don't like that. I guess we'll try a few sessions with her (next month) and decide if we want to continue with her at all. So far I am very unimpressed with the ECI services in this area. They are just so slow to get the ball rolling. I still haven't even heard a word from a vision therapist! Nothing. Don't get me started. Anyway, Reagan only took one small 30min nap today during her Feldenkrais lesson, and then around 6pm she konked out. I mean, she was out cold. I sat her down on the recliner to go and get something from the other room and when I came back, she was asleep. And she slept there for 5hrs! She probably would have slept all night but I started panicking around 3.5hrs and tried everything to wake her up. It took me another 1.5hr to finally get her awake. I'm not sure what that was all about...but it did scare me a little. She's wide awake now and it's midnight...fun, fun. We started a new medication today, Zegerid for her acid reflux. It's basically prilosec combined with an antacid. Another parent recommended it to us and since the Nexium wasn't helping her, so I asked her doctor if we could give it a try. Unfortunately, I didn't know much about it. It comes as a powder that you dissolve in water and it's not the best tasting. Probably similar to alka-seltzer. I think this is probably perfect for kiddos with G-tubes, but not so much for Reagan. Anything you have to shoot into Reagan's mouth by syringe is never a good thing. This morning's dose was nearly impossible to get down her with her gagging and choking almost nonstop. I thought I was going to have a nervous breakdown trying to get her to take it all! Then tonight, I cheated and gave it to her while she was sleeping. She never even cracked her eyes. I want to see if it helps her, so I'm going to do my best to get her to take it for at least a week or so. It will definitely be a challenge! It sure would be nice though to finally find something to control this pesky reflux! With all the recent medication changes we've really going back and forth with sleep. Some nights are great (like last night) and Reagan sleeps the whole night through and then some nights it feels like I spend more time awake than asleep. It's so hard to get an accurate read on anything. Is it the medication interfering with her sleep...is it the seizures...who the heck knows? And the same goes for the seizures...is it the medication changes making them worse...are they just evolving and getting worse on their own...nobody knows. It's very frustrating. I do know that Reagan woke up this morning feeling a little better and that was a relief. She's still got a runny nose and was more sleepy than usual, but her overall demeanor was much improved. She's been very sweet and vocal all day today. She was even talking all through her Feldenkrais session! Tonight when Mike got home from work he came over and said something to her and immediately she started saying dada/dadee. It was too cute! I really think she's trying to talk! This weekend when my mom was over helping me with all of the painting, she snuck up on Reagan. She didn't say a word but got in her line of sight and Reagan got all excited and started saying Gaga!!! You have to remember, Reagan has vision that is significantly impaired, so that was very impressive! Now...if only we could get her saying mama! I hear it occasionally, but it's usually when she's crying and upset. I guess that's just how it goes. Hopefully she'll sleep well tonight, I could use another good night's sleep and so could my little sick girl. She was giving us a little grief at bedtime, so it'll be interesting to see how it all works out. Continued prayers are appreciated. Last night was one of those nights. Not good, not good at all. The tummy pains that started just before bedtime continued to plague Reagan all night. She was restless. She was fussy, having a hard time breathing, and just couldn't fall and stay asleep. I would finally get her to sleep but the second I tried to get up with her or lay her in bed, that was it, she was awake and crying. I was up with her for quite sometime. Needless to say, she did not get the rest she needed to recoup. Today she was definitely feeling worse than yesterday, which is unfortunate, because I was hoping she was on the upswing of things. I went ahead and canceled all of her therapies and we just lounged around the house today. She wasn't her happy, energetic self. She seemed drained and on edge all day. Seizures have been rough too, so that makes everything worse. Poor girl. I think I'm probably going to have to cancel her aquatic therapy scheduled for tomorrow. 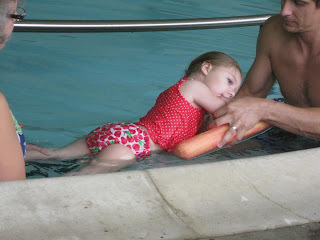 I really hate to do it since it's only her second session, but the pool just isn't a good idea for the sniffles. Maybe she'll be up to going to her Feldenkrais session. I just hope she gets some sleep tonight (me too) and is feeling better by morning. Please keep her in your prayers!! Last night we did finally get some decent sleep. Reagan continues to feel under the weather, still very sniffley and sneezy but less pitiful looking than yesterday. She seems to be doing fine with the Banzel increase...although we're yet to see any seizure improvement. She did have a little bout of tummy pains tonight right before bedtime. Poor thing, she was really upset. Thankfully this is the first we've seen of these in quite sometime (probably a month or so), a huge improvement to the hours of inconsolable crying we were dealing with before every couple days. Hopefully they won't interfere with her sleep. Being sick, she definitely needs her rest. Today was another productive day with the house. 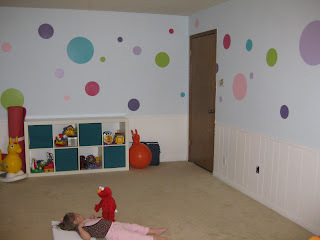 We finished painting Reagan's therapy room which was a huge undertaking. It had some outdated wood paneling on the lower half that we painted white and then we painted the dingy yellowish-orange upper part of the wall a pale blue. It's very beach house-ish. Very light and bright, I think it will be a perfect therapy room! At some point we're going to add different colored dots on the wall as an accent to give it a little more character (kind of like the dots on her blog). Not sure what our agenda is for tomorrow. I'm hoping Reagan's feeling a little better. She's got a couple therapies scheduled, so I guess we're just going to have to wait and see if she feels up to it. Please continue to keep her in your prayers! Today hasn't been the best of days for our little one. Reagan was up again last night, we tried her in our bed but finally I just had to get up for 1.5hr with her. As soon as she woke up this morning it was clear she was not feeling up to par. Her nose was all crusty, her eyes all red and puffy. She's definitely come down with something. It's not like she's been bad or even whiney, she's just been very snifflely and all around lethargic. Poor thing, you can tell she feels like junk. I'm hoping it's a short term thing, I was feeling horrible yesterday but I felt loads better today (although mine could have just been allergies). Even with a sick kiddo we've managed to get a lot done today. My mom and I primed Reagan's therapy room and the master bathroom (the remaining two rooms that have to be painted), while Mike tore down this strange storage structure the former owner built in our garage that was taking away from our parking space. All in all, it was a productive day. Seizures are still not good. I'm sure the fact that she's sick isn't helping any. I went ahead and increased her morning dose of Banzel, now she's at 1/2 tab 2x day. We're still hoping to see some improvement...maybe once she gets over this sickness. Please keep her in your prayers...she sure needs a break! Unbelievable...Reagan slept last night from 8pm-6am!!! It was awesome! That's 10hrs of uninterrupted sleep for our little one! That doesn't happen often, so we are always amazed when it does! I woke up with nonstop sneezing and red itchy eyes. I think it's just allergies, but I've been pretty miserable all day! Reagan has sneezed a couple times too, so I sure hope we're not getting sick. Her Feldenkrais practitioner mentioned that her granddaughter was fighting a cold, so that makes me a little nervous. Reagan hasn't had a single vaccine since her 4mo shots, so I'm always nervous about her being anywhere near sick kiddos. I've actually been putting off taking her to the pediatrician's office for quite sometime now because everytime she goes in there she picks up something nasty (although I finally caved and made an appt for Sept 30th). We've actually got all kinds of appts coming up, which means even more exposure to the germ infested world. Scary. Today was an easy day for us, only one therapy to go to... feeding therapy. Reagan tolerated the stretching without a problem and then took some good bites of graham cracker sticks (which she also chewed like a pro). Some of it came back out, but I was really impressed at how well she did with those! That's the closest thing to real food that she's ever eaten! Baby steps, but we are definitely making some progress. Seizures are still about the same. Mornings are the worst, but really anytime that she wakes up from sleep she has a ton. Yesterday she only had 2 of the bigger myo-tonics, and I was hoping it was the beginning of a trend (so I didn't want to jinx it by mentioning it in yesterdays post), but today she's had a lot of them. And they're really upsetting her. A few times she actually cried after them. I really hate these. Especially the moaning and crying afterward. It breaks my heart. I just want to see some real improvement. Improvement that lasts. And continues. When are we going to see that? Hmmmm? I think it's time. Unfortunately, I know that's not how it works. It's not going to happen in my time (obviously, or it would have already happened a long time ago), but in His time. But when exactly is His time? I guess we just have to keep hoping and praying that it will be soon. Sleep...at last! Reagan finally slept through the night last night. And that's without me lowering her nighttime dose of Banzel. Maybe she wore herself out with all the squealing and babbling? Who knows, but it was nice! Unfortunately I don't think it's going to happen tonight because she fell asleep at 8:15pm, which is way too early for her, I keep waiting for her to wake any moment now. Today was a pretty easy day therapy-wise, she only had Feldenkrais and that wasn't until 2:30 in the afternoon. I wish I could say I got a lot done today but I didn't. 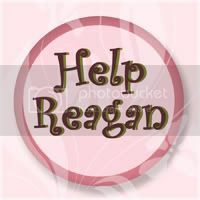 Reagan was very high maintanence and whiny, a little out of character for her of late. Hopefully she'll cheer up and be back to her happy self by tomorrow (or tonight if we're up). We did get an exciting delivery today...a budget bubble column! I found one online for $169, I know not that budget friendly (we used some of Reagan's leftover birthday money for it). Although when you compare it to the other option which is a couple thousand dollars, it's very reasonable. Reagan seems to like it just the same! It automatically cycles through red, yellow, blue, and green and it's also switch adapted (which means you can plug a switch into it in order to teach cause and effect). I think it will be really great for her visually. It seems to hold her attention and I can't wait to find a good place for it in her therapy room (I'll have to post a picture of her watching it)! The only concern for more mobile children would be that it's not as heavy/sturdy as the bigger tubes and might be tipped over fairly easily (although you could probably figure out a way to weight it down or brace it). The sleep issues continue. I don't know if it's the increased pm dose of Banzel or what but Reagan hasn't been sleeping worth a darn the last couple nights. Last night she woke up crying, we put her in our bed for a while where she tossed and turned, and finally at 5:45am I got up with her for good. The thing is, she's not sleeping much during the day either. Just a little nap or two, certainly not enough to make up for her being up all night! She's actually been quite wired today, especially tonight. When Mike got home she was squealing and talking up a storm to him. There's no doubt in my mind she was saying Dadee and Dada to him. No doubt. Giggling, squealing, and babbling...she went on like this for more than an hour. It was so funny! I had to break out the video camera to document it. It's not often that we see her this way. I'm not sure what it was, but she was down right giddy! It was really cracking us up! (See video below...make sure you pause the blog music.) I spoke to the neurology nurse today about the possibility that the Banzel is affecting her sleep and she mentioned that they really don't know a lot about this medication but they don't think that's one of the side effects. Their suggestion was to just lower the dose back down to 1/4 tab 2x a day to see if it helped. I think I'm going to wait one more night before trying that. Just to see if history repeats itself. If so, no worries, I'll lower it. I'm hoping maybe she'll just get used to it. We'll see. Reagan had physical therapy this morning (where we talked about another round Botox and serial casting), she had her blood drawn (for a test to look for mitochondrial DNA deletions and mutations in the blood), then she had her Feldenkrais lesson (and fell asleep toward the end, she was so relaxed). She's had a busy day and then a crazy hyperactive night, maybe she'll actually get some sleep tonight?!?!? Oh I hope so! Reagan did finally go to sleep last night and stay asleep...so that's always a good thing. Today has been a busy day of therapy. Feeding therapy was first and it went well. Her therapist took a class this weekend in Myofascial Release in the face and neck and was excited to try some of the techniques on Reagan. She was very cooperative, especially since it involved some serious stretching. Her therapist also noticed today that she seems to be getting more coordinated with her tongue, which is great, she needs that coordination to help her manipulate foods (instead of just formula). Then we moved down the hall to occupational therapy. She did some swinging and ball work with Reagan and was very happy with what she saw. By putting her in a frog like position on the ball, she was able to break up the tone in her lower extremities while encouraging her to bear weight through her arms (this made for some really cute pictures). She was a little whiny at times, because after all it was hard work, but all in all she did great! After two intensive back to back sessions she was pooped and fell asleep in the car on our way to her Feldenkrais lesson. She slept through most of the lesson but her practitioner didn't seem to mind since it allowed her to work on areas that would be more challenging if she were awake. She did wake up toward the end and bent her legs up toward her chest and kept them there for quite sometime (which is out of character for her). Maybe it's a sign that she's loosening up? I hope so. 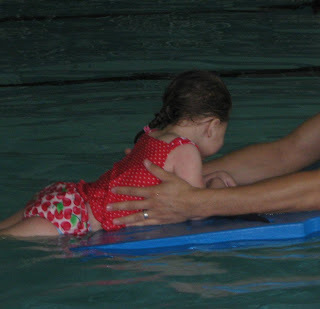 Tomorrow is an exciting day...it's Reagan's first session of aquatic physical therapy. I hope she likes it! I think she will but you just never know. The physical therapist from Texas Children's, the one she's already seeing, is going to be doing it...which is great because we already know her and like her. I can hardly wait to see how she looks in her bathing suit! I'll have to take some pictures. Seizures are still rough. At this point we're not seeing any improvement with the Banzel and it's hard to tell if they've gotten worse. When they're this bad, it's hard to tell if they're getting worse or just staying the same. It's so frustrating to watch her bombarded all day long with these things! I decided to go ahead and increase her Banzel dose tonight. So now she's at 1/4tab (50mg) in the am and 1/2 tab (100mg) in the pm. I want to see improvement. I mean really, enough is enough. She SO needs a break. Please keep her in your prayers...we need this to work! Reagan slept last night...whew! Thank goodness we needed some sleep. Only problem is she went to bed early again tonight. She was out cold by 8:45pm (and up an hour later). Only one small nap today made her a little whiny this afternoon. She has a really busy day tomorrow, so hopefully she'll get some rest tonight...eventually. Tomorrow's itinerary consists of feeding therapy, occupational therapy, and then Feldenkrais. All back to back to back. We'll see how that goes. Not much going on today. With Reagan taking only the occasional short nap, I feel like I have no time to get anything done around the house. Still lots of boxes to unpack. Will we ever get it all done? We did make a trip to Lowes today (probably our 100th trip...good thing we have one less than a mile away). Reagan seemed to enjoy it...riding around in her stoller, looking up at all the shiny things. She's so good. And such a sweetie. She's been very talkative again today. It's amazing how she can continue to be so spunky even with all these seizures. We're still not seeing any improvement seizurewise. I know she's still at a low dose, but it's beginning to look like all of the other medications. It's frustrating. Please keep her in your prayers. Reagan, Reagan. What a handful you were last night! Reagan fell asleep early around 8:30pm but I figured it was late enough for her to make it through the night. Nope. Not even close. She woke back up around 11pm, right as I was thinking about going to sleep. So I sat up with her, thinking surely she will get tired and fall back asleep anytime now. At 1am she was still going strong. Very alert, very awake, very talkative. I even broke out the camera to get some pictures of her because she was just too funny! Finally around 1:30am I gave up and decided to try her in her bed. She wasn't going for that and started crying. I got back up with her and gave her some juice and immediately she fell asleep. I laid her in bed and then about 10min later she woke crying again. This time I made Mike get up with her and he managed to get her to sleep for good. Not sure why she was so wired. That scares me a little. I don't want to have to battle that every night. This morning she woke at 7am sharp with a bloodcurdling scream! I don't know if she had been fussing and we just never heard her until it escalated or if she had a dream that made her wake up that upset, but I jumped out of bed and scooped her up immediately. She was gasping and crying, poor thing, what a miserable way to wake up! Thankfully she calmed down and was fine. She's been good all day (despite having lots and lots of seizures). Super talkative. I took a video of it a couple of days ago. Probably not the best representative of it but still very cute...I'll have to post it. It really seems like she's really trying to talk. Way more babbling than she's ever done. Even her feeding/speech therapist was impressed when she heard her the other day. She did have a slight fever at one point today. Her head was hot, I checked her temp and it was elevated, so I gave her some Tylenol and the fever was gone before it even had a chance to take effect. Not sure what that was about. Tonight we went to church. It was nice, it's been a while since we've gone because of the move and all. Reagan was asleep when we got there and I was a little worried about just dropping her off in the nursery that way, but apparently she did fine. They woke her up to play with her (they've missed her) and said she was very sweet and happy the whole time. She was looking at the light up bubble tube when we picked her up. She loves those things. They have really great ones at Texas Children's in the waiting rooms (I guess because they know you'll be doing a lot of waiting). She likes to watch the bubbles and the little fish float up and down in them. It's very soothing to her. We really need to get one for her but they are super expensive (1-3k). I've been researching all night some cheaper alternatives. I would love to get something similar for her therapy room. Maybe I'll get one of the smaller ones. I just hope she likes it as much as the bigger ones. We'll see. Anything for this precious one! Reagan has been a sweetie again today. She had that one rough spot last night but she still slept through the night and woke up in a good mood this morning. She even had two dirty diapers today without crying! The only therapy she had today was her morning Feldenkrais lesson. I don't know if she enjoys the lesson itself or just really likes the practitioner that works with her, but she hasn't had a bad session to date. I have to admit, it is a very relaxing atmosphere. Very quiet. Reminds me of a massage or yoga. It's actually hard for me to stay awake while watching! Then we came home and I spent a couple hours on the phone trying to sort out the whole change of address thing with Medicaid and MDCP. What a mess. They certainly don't make it easy. It's still not straight but maybe by next month everything will be settled. Then this afternoon a few of the things we ordered for Reagan's therapy room were delivered. Only problem, part of our order was missing. It seems any time we get something through this company there is a problem...it's the wrong item, the wrong size, it's late, or something's missing...they never get it right! You know, we pay extra for this "exceptional" customer service! Ridiculous. Now all we need to do is paint the room and unpack and organize everything so we can use it as intended. That's all. I'll try to get on that this weekend. Please keep Reagan in your prayers...she really needs this new medication to give her a break from these nasty seizures. Reagan finally slept well last night. Thank goodness. I did not feel like getting up again for another late night rendezvous. Which is good because we had a busy day today. 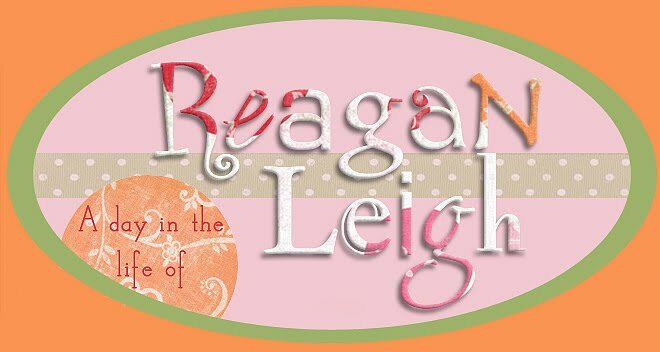 This morning the ECI coordinator came by to tell us that Reagan's vision services still haven't been figured out. It's ridiculous that it's taking them so long to get the ball rolling with this, it's not like we moved from another state, we just switched counties. In my experience of late, anything going through a state run agency is extremely slow and covered in red tape. I still haven't been able to get them to change our address on Reagan's medicaid card (which means we haven't gotten one in two months). When I called the 1-800 number they told me that my name wasn't on the account and that they couldn't discuss anything with me (who else is supposed to deal with this...Reagan?) and then when I call the local number it just rings and rings and rings. No one ever answers (no matter which button you press) and there's no machine to leave a message. Talk about ridiculous. Anywho, sorry for getting sidetracked, then we headed over for Reagan's Feldenkrais lesson. This is her 3rd week of sessions (although this week was cut a little short with the labor day holiday and with her getting sick yesterday). I am noticing some changes. They are slight but noticiable. She's still extending a lot, but it has gotten much easier to break her out of it. She also has a tendency to look in one direction (to her left when laying on her back and to her right when on her tummy or being held), but just the last few days I've noticed her voluntarily turning her head back and forth during the session looking around at things. Like I said, little things, but I'm hoping they'll all come together and eventually we'll see some big steps forward. I do think it helps having the sessions on a regular basis. There was no way we could have afforded to do these sessions out of pocket 5 days a week; what a blessing it is to have this practitioner offer her services to us free of charge. I'm not sure how long this will continue, but for now we're just going to go as often as we can to see if it helps Reagan. Then we headed over to feeding therapy. At this point Reagan was exhausted and fell asleep in the car. I picked her up and took her in but she was still out cold! Totally limp. She slept through most of her session, which allowed her therapist to do some serious mouth stretches that she wouldn't have been able to do otherwise. She woke up with about 15min left but she was having so many seizures food was not a good idea. Poor thing. They were really knocking her for a loop. Speaking of, I increased her Banzel tonight (1/4 tab 2x day). It wasn't really time to increase it (he wanted us to wait a whole week) but I haven't seen any problems with increased sleepiness or anything since we started so I thought I'd give it a go. She sure needs some relief from these seizures. Please keep it in your prayers that this helps. She had a little bout of tummy pains tonight so I'm hoping her sleep is not affected. It's actually been almost 2 weeks since her last tummy pains so I was hoping things were getting better in that department. I don' t know if the Duocal has been helping her or what, but things have been pretty regular and happy since we started her on it (although that's not its intended purpose). Please keep her in your prayers...we need this darn Banzel to start working!!!! Sleep last night was almost identical to 2 nights ago...not good. Reagan woke up the second we laid down in bed. That's never a good thing! We managed to get her to sleep with us for a little while, then I got up with her around 1:30am and we were up for at least an hour. I've been dragging all day. This morning we headed up to Texas Children's for PT. I'm not crazy about driving all the way up there for PT but we'll see. It was the same lady that did Reagan's evaluation and she worked her hard (she's the same therapist who will be doing the aquatic therapy starting next week). Reagan was pooped by the time we left. We had some time to kill before we had to head over for her Feldenkrais lesson so we went to lunch. I gave her several bites of my food and she loved it! She's been eating well lately. Monday she ate at least half of a ripe mashed up pear and yesterday she ate half of a mashed banana. So I didn't think it would be a problem to give her a few bites of my squash and spinach casseroles. Bad idea. I don't know if it was just too rich or if she was allergic to it or what but by the time we got out to the car she was making funny noises and I was concerned. Then she proceeded to throw it all up. Thankfully my mom was with me and she was able to catch it all and soothe her as we headed home. We canceled her afternoon lesson and took her home to sleep. She took a good nap and woke up happy but then tried to throw up again. Her eye was all swollen and she just looked miserable. Poor thing. I gave her some pedialyte slowly over the next few hours and then finally tried my luck with a bottle tonight. She seemed OK so hopefully all is good now. She did get a little whiny tonight and I was worried she might have another episode but it turned out to just be a dirty diaper. We need some good sleep tonight and less seizures. Don't forget to keep that in your prayers! Thank goodness Reagan slept well last night! The night before was rough, so I was concerned about her having a repeat performance. She woke twice and cried out, but by the time I got to her she was already back asleep. Today we started the Banzel (medication #14)...only 1/4 tablet (50mg) once a day to start off. I think that's a very low dose to begin with but our doctor seems to be very conservative when starting Reagan on new meds. So far, I haven't noticed anything. Seizures were nasty again this morning. I went ahead and video taped her about 30min after waking up and in only 1min I captured all of her seizure types (sorry it's not the best quality so it's a little dark and hard to see). Lots of twitches, those happen all day but are especially bad in the morning (you'll see them in her arms and legs). Then at 30sec she has a spasm. Those have definitely decreased but are still present throughout a day. Then at 53 sec she has a nasty myo-tonic...these really leave her dazed and seem to upset her (and me as well). It's hard for me to go back and watch. I see this all day long, I hold her as she has them all day, everyday. But for some reason it's even harder for me to look back at them and see her struggling all over again. I just hope and pray that one of these medications will finally provide her some relief from these horrible things. I want Banzel to be the one. Please say some extra prayers for my little one. Last night was not a good one. I knew we were in trouble when Reagan fell asleep at 7:30pm and would not wake up to take her medicine. I had to just put it in her mouth and move her chin around until she swallowed. Certainly not the best way to do it but we really had no other option. Then just as we were crawling into bed at 11:30pm, we heard her fussing. Mike put her in bed with us and she fell back asleep. She woke back up at 2:45am and she was wide awake. I got up with her and gave her a bottle and she was talking and squealing up a storm. So funny. I couldn't be too mad at her. We sat up til 4 and then I finally just laid her in her bed awake. That lasted all of about 15min and then Mike got up with her. It only took her 10min with Daddy to fall asleep! Turkey! I don't think it had anything to do with decreasing her Clobazam...at least I hope not. I really think it was the fact that she didn't take but one little nap yesterday. Just in case, I decided to change her Clobazam amounts around. She was getting 1/2 tab 3x day, so today I gave her 1/2 am, 1/4 midday, and 3/4 pm. I think we need to phase out the midday dose anyway...and for sleep I would think the only dose that's really important is the pm dose. But what do I know. Maybe I'll email Dr. Chugani and ask his opinion on it. Seizures have been beyond frustrating. Last night when she woke up, they were nearly nonstop. No wonder she was having such a hard time going back to sleep. I need to video them so I have some documentation of what they look like right now (lots of twitches, a few spasms, and the myo-tonics). It's probably been a year or so since I've video taped any of her seizures...it's just so disturbing...but I think it's important to keep track of how they evolve over time. Maybe as we start up the Banzel this week, there won't be anything left to record!?!? That would sure be nice wouldn't it. Please continue to keep her in your prayers! Reagan was a little more feisty today, more talkative but also more whiny. Still no crying fits, so I'm happy about that. Seizures, well I'm not happy about those. Still yuck. I'm going to decrease her pm dose of Clobazam tonight so she'll be on 1/2 tab 3x day. Then maybe we'll start up the Banzel tomorrow or Tuesday. 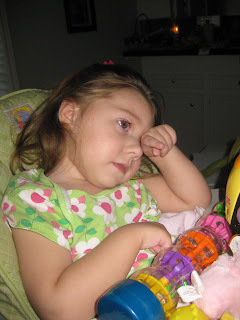 It's so hard to make these decisions but she definitely needs some relief from these seizures. Mornings are just the worst! Very twitchy. Hopefully the Banzel with help with all of the seizure rypes she's having right now. Tonight we ventured across the street and met some of our new neighbors that were having an early labor day party (they had put an invitation in our mailbox). I'm still amazed at how nice the people on our street are...so much better than our old neighborhood! Reagan was well behaved, we took her over in her new stroller and she was content in it the whole time we were there. It's still a little awkward meeting new people and having to go through Reagan's laundry list of problems everytime. We usually try to say the least amount possible but then come the questions...Is she asleep? Do you want to give her something to eat? Do you want to let her out of the stroller? Why yes, yes I do! Most people that see her think she's normal (or typical) at first glance. And then of course we feel like Debbie Downers for going into detail about the real situation. Oh well, it is what it is. It's our new normal. Filled with doctors visits, therapy sessions, and an endless list of medications. I hope and pray that things get better for our little one, but for now this is our reality. So Reagan has been on a streak of sorts. She's had some really great days lately and although today she was not as talkative and happy as she's been, it was still a good day. She continues to sleep great, which is such a relief considering that we've been lowering the dose of the medicine that helps her sleep (since it's not helping her seizures). It's going to be tricky to see how low we can go before it starts affecting her sleep. Mike's parents are in town for labor day weekend and this is probably the most content they've ever seen Reagan. Today was the first day in a week that we've even heard a whine out of her (other than after a seizure). 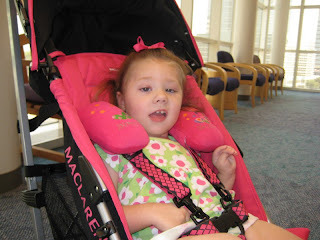 These new seizures she's having, what her doctor called myotonic, they really upset her. She stiffens up and then moans and fusses and it takes a while for her to settle down after them. I don't like them one bit. I don't know if maybe her seizures are morphing into this new type or if she'll just have these in addition to the other ones she has. Ugh. Have I mentioned that I hate seizures? The thing is, I'd almost prefer them changing into a new type because we certainly haven't been successful in treating the spasms. Speaking of, we'll start up with the Banzel next week, so please keep her in your prayers. I'm hoping we can keep this good mood streak going. Reagan fussed a little tonight but she was working on a dirty diaper and I'll take a little fuss any day to screaming and crying! But seriously, she's gone an entire week without any fuss...zero whine! It's amazing really. And I've enjoyed every minute of it! Thank you for keeping her in your prayers. So today was day 6 of Reagan's good day streak...and we're still going strong. Maybe it's the good night's sleep she's been getting, I know it makes me happier. Today she had her Feldenkrais/ABM session first thing in the morning and then we ran home for literally 5 min and then headed straight over to feeding therapy. She spent a lot of time in the car seat without so much as a peep. Oh I remember the days when I couldn't go 5 miles without her screaming and holding her breath the whole way. She's just been so good lately! She did really well in feeding today. She ate 4 veggie sticks (the puffy, chip-like things that dissolve very quickly and don't pose a choking hazard) and then about 1/3 of a snack pack of applesauce. She was really enjoying the applesauce. I need to make a trip to the grocery store. Then when I got home I mushed up 1/3 of a banana and she ate that up too! She has always liked banana baby food but she's never been a fan of the real thing. When you mush a banana it gets really slimy and she's usually not very good at managing that texture but today she did a great job and nothing came back out! She's still very spitty but somehow she can manage the food and swallow it down while letting only spit come back out! Her therapist thinks the spit might be related to reflux. Reagan has silent reflux, it rarely causes her to throw up, but you can hear it coming back up on a regular basis. I sure wish we could find something to successfully treat her reflux but she's been on Prevacid, Zantac, and now Nexium and nothing seems to do the trick. Just another frustrating thing to deal with. That has to affect her eating. I can imagine I wouldn't want to eat with stuff bubbling up my throat all the time! Yuck! And yet she's been such a sweetie! This girl, she's a trouper! Another good day for Miss Reagan. This is some kind of streak we're on! Usually she only goes a couple days or so before she has a day ruined on account of tummy pains. We're five days and going strong. Sleep is good...all is good. She wasn't nearly as talkative today as the last few days but she still had her moments. Not too much to do today. We went for our morning session of Feldenkrais/ABM and then tonight Reagan accompanied us to Bible study. Everyone commented on how big she's gotten! The funny thing is, I don't think she's really grown much if at all. Maybe I'm measuring her wrong, because it sure seems like she's getting longer, but I'm getting the exact same length as when I measured her months ago. One thing I am certain about is that she's not gaining weight. Not a bit in 9+ months. She's stayed exactly 27.5lbs. Now I know, she's not exactly falling off the growth chart, but my concern is that this downward trend is going to continue and with her being such a difficult eater it will be impossible to get her caught back up. So I found something called Duocal (thanks to Madie's mom) that we can add a scoop here and there to her bottles to help increase her calories. It's a tasteless, soluble powder that adds 25cal per scoop and it's milk-free, unlike the benecalorie we were wanting to use previously. Only problem...it's expensive ($30/can)...but then again, isn't everything. At least it was easy to get, I just called Walgreens and asked them to order a can, it was there the next day. So we'll see. She seems to be tolerating it digestively, so that's good. I'm still debating on when to add the Banzel. I think I may wait until next week (with the holiday weekend and all), that way if I have any questions or concerns I can actually get a hold of a doctor. Please continue to keep her in your prayers, she's dealing wth a lot of seizures right now (especially when she wakes up), she really needs something to work! Today has been another great one for Reagan. Seizures continue to be tough but you'd never guess it by her attitude! She's been so happy, so smiley, so talkative! I just love it when she's like this! I'm excited by the fact that this talking (or babbling) streak has gone on for days now. Lots of jibber jabbering...all day long. This morning she had her 3 week post op appt for her cataract surgery. They dilated her eyes and gave her a clean bill of health...both eyes are finally clear! Hopefully that was her 4th and last surgery! Then we headed over to Reagan's Feldenkrais/ABM session. Again, so happy and cooperative. She was just so animated today (see pictures below)...almost hyperactive. And then the whole day went by and she still hadn't taken a nap! I couldn't get her to wind down! She finally fell asleep at 4pm but only slept for an hour at the most. I'm wondering if we're going to be able to get her to stay asleep tonight. She already fell asleep once but woke up an hour later...not a good sign. We're still tapering down the Clobazam. Right now she's at 1/2 pill am, 1/2 pill midday, 3/4 pill pm. I want to lower her dose since it's not really helping her seizures, but at the same time I want to keep her sleeping. I can't even begin to explain what a blessing it has been for us to finally get sleep again. Awesome! Now if only we could get these stinking seizures under control...we'd be happy campers. Please continue to keep Reagan in your prayers she needs a break from seizures. Look at the expression on her face...she was talking away! This is her new stroller, notice the nifty little shoulder pads, they give her head that little extra support she needs (thank you babies r us). I know, not the best pic with my giant hand in the corner, but look at those long legs! Reagan has been great again today. Such a sweetie. Talking up a storm and just being all around darling. We had a meeting with her new ECI coordinator this morning. It took a while to finally get someone out here but I think it was worth the wait. She seems to be on top of things and hopefully we can get services rolling soon because Reagan has been almost a month now without vision therapy. After that we headed over for her Feldenkrais session. The practitioner works out of her home and lives about 30min away and little Miss Reagan fell asleep only seconds before we got there. All was not lost though, she went ahead and did the session with her sleeping. It allowed her to see another side of Reagan...one that's not always tense and extending. She ended up waking up about 30min into it but then the seizures started up (actually she had some while she was sleeping too). Have I mentioned how much I hate seizures? I went to the pharmacy today to pick up the rest of her Topomax (they never give us the full amount on our first trip) and they already had the Banzel her doctor called in. Not sure when we should start that. I just hate adding a new medication when we're in the process of decreasing another. It makes it impossible to figure out what's really going on (although do we ever really figure out what's going on?). Her doctor wasn't really clear on when we should start it. You know, when I was asking him about weaning her Clobazam he actually asked me how I wanted to do it! Seriously...isn't he the one with the MD? So here we are Reagan's honorary neurologists and I'm still not sure what to do. Frustrating. Please keep her in your prayers as I attempt to come up with a game plan for all of this.